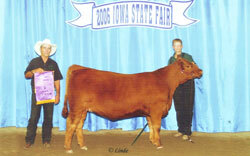 Our goal as Iowa kids was to have a Grand Champion at the Iowa State Fair. We finally realized our goal. 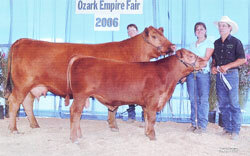 Wyatt is a son of Ory's Cherokee McCue and Tenn Queen Ellie (our donor cow) and a full sister to Tiger Woods. He was also Junior Champion. 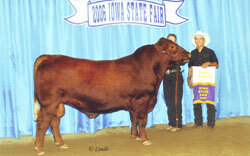 Cricket is one of our donor cows.